If you’ve ever tried to take Highway 400 out of the city on a long weekend, you might have noticed that the Greater Golden Horseshoe is growing fast. With an exploding population that is expected to reach over 11 million by 2031, we really need to look forward in planning development for the fastest growing area in Canada. Accommodating new growth with the sprawling low-density developments that are rampant throughout this area will only mean bad things for our quality of life and our environment. Luckily, Ontario has a Greenbelt, created in response to the uncontrolled sprawl Ontario has seen over the last decade. In numbers, the Greenbelt is very impressive: it is the largest in the world, protecting over 720,000 hectares of countryside, including agricultural land, wetlands and green space. When you think about the Greenbelt, it might conjure images of hiking or horseback riding, but the scale and importance of the land reaches far beyond recreation. The ecological services of the Greenbelt are many. It is essential for providing clean air and clean water to cities, with its trees acting as air filters and rivers and streams being the sources of drinking water for millions of people. A recent study has illustrated that the value of the Greenbelt’s measurable ecosystem service is estimated to be $2.6 billion annually. While the successes of the Greenbelt are many, some elements within the legislation are failing it. For example, the proposed GTA West Corridor Highway is permitted within the legislation, but its effects on the Greenbelt will be devastating. The impact of the project appears to be easy to measure. Construction of the highway will eat up about 4,800 hectares of agricultural lands. But this is only one piece of the puzzle. Ecological systems are only functional if a whole system is preserved. If you pollute the headwaters, you are polluting its streams. When a highway cuts through the Greenbelt, as the proposed GTA West Corridor will do, it fractures the essential systems that the Greenbelt is meant to protect. Carving the Greenbelt into pieces with highways challenges the overall integrity of what the Greenbelt is meant to do. The other challenge is that laying down highways just moves sprawl a little further out. 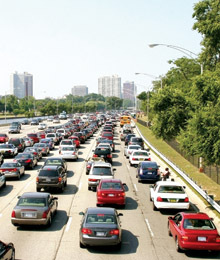 It does not prevent poorly planned, low-density neighbourhoods – it just places them over the Greenbelt, increasing gridlock and reliance on cars, and adding to air and noise pollution.There is no question that the Greater Golden Horseshoe has a major gridlock problem, but creating more highways will create more congestion, not less. According to University of Toronto researchers Gilles Duranton and Matthew Turner, “roads cause traffic.” Their study, The Fundamental Law of Road Congestion, concluded that road construction can never keep pace with road congestion. The issue of gridlock will not be solved with more highways and less Greenbelt. What we need is more complete communities and less drivers.